As inevitable and reassuring as the first blooming larkspurs of spring, today sees the season’s first delay of Lil Wayne’s new album: The already-long-awaited Tha Carter IV has been pushed back yet again to June 21 from May 16, meaning the above cover photo is no longer perfectly timed to coincide with graduation—though we suppose it’s never too late to Photoshop on a bridal veil. 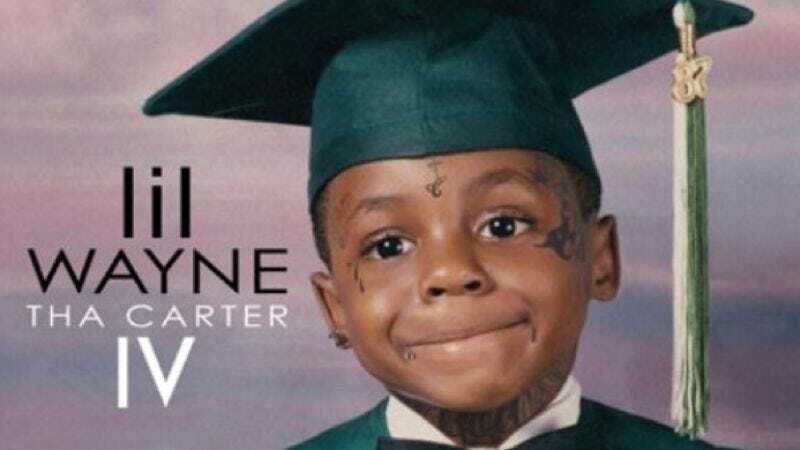 In an interview with MTV, Young Money’s Mack Maine confirmed that the reason for the delay is that Wayne is “still perfecting a few things… changing a few lines,” while also making room for a “huge” crossover single “along the lines of a ‘Lollipop’” that will reportedly feature a collaboration with a secret “major group,” the likes of whom you would presumably never suspect to be working with Lil Wayne, given their genre. MTV names Green Day, Kings Of Leon, and Paramore as possible suspects, but these seem a bit too predictable given Wayne’s rockist work on Rebirth. We’re going to guess a reunited Alabama.